Dan Reilly explains why the Brazilian soccer player’s performance this month is about more than athletic achievement. Why the Brazilian soccer player's performance this month is about more than athletic achievement. From the magazine: ISSUE 92, June/July 2014. Brazil’s number 10 jersey might as well weigh a hundred pounds. Famously worn by Pelé, the legendary forward who is arguably the best soccer player of all time and a three-time World Cup winner, that uniform is reserved for the national team’s star, one whose play-making talents transcend those of his teammates and opponents alike. For the 2014 Cup, that number 10 honor belongs to 22-year-old forward Neymar da Silva Santos Júnior, known internationally by his first name only. This year marks Brazil’s chance to win its first-ever championship on home soil; their last chance, in 1950, ended in a 2-1 upset loss to Uruguay, a defeat that still stings the team’s fiercely devout fans 64 years later. Maybe, this year, the jersey weighs more like 200. But Neymar seems ready to wear it. He’s one of the biggest names in his sport, often mentioned alongside such stars as Portugal’s Cristiano Ronaldo, Argentina’s Lionel Messi, and England’s Wayne Rooney, all of whom are at least four years older. He’s absurdly quick, with the kind of on-field vision and footwork that lets him snake through the toughest of defenses, running around and through multiple opponents at once. He can curl the ball so accurately that it finds his teammates for open shots, or he can just utilize his power and kick it into the net himself from 50 yards out. His YouTube highlight reels, of which there are dozens, feature one “how’d he do that?” moment after another. Despite a petition of over 14,000 signatures and the insistence of Pelé, the Brazilian coach didn’t select Neymar to the national team for the 2010 Cup, when the squad lost to the Netherlands in the quarterfinals. He earned his place soon after thanks to new coach Mano Menezes, and already has made 30 goals in 47 international games, 11th all-time for team Brazil. He helped them win silver at the 2012 Olympics, and led the team to a championship in the eight-team FIFA Confederations Cup in 2013, scoring a goal against Spain in the final match, which was played in Rio. His four goals in five games helped him earn the Golden Ball, the award for the tournament’s best player. As a member of Barcelona for the 2013-14 season, Neymar had an up-and-down season after missing some time with an injury and adjusting to his new teammates’ style of play. His talents might not have translated to the European leagues as well as hoped, likely due to his decision to stay with top Brazilian football club Santos FC (also Pelé’s alma mater) a few years longer than is expected of players of his caliber, who are often signed away for big sums in their teens (Neymar was 21 when he made the move). He claimed he wanted to stay in Brazil and play out his contract, but it helped that the transfer offers he was getting from the big-name clubs abroad grew massively every year. He eventually settled on Barça, agreeing to a fee that allegedly cost the team somewhere just shy of $80 million for a five-year deal. With that bigger stage, Neymar is experiencing a kind of fame unparalleled in Pelé’s day, thanks to bigger TV exposure, social media, global branding deals and gossip journalism. To put it in perspective, in the States he’d be a much younger combination of Justin Timberlake, LeBron James and Leonardo DiCaprio. He’s got over 10 million Twitter followers, nearly another 5 on Instagram and has dated Brazilian celebrities like actress Bruna Marquezine and supermodel Gabriella Lenzi. TIME put him on its cover, a first for a Brazilian sports star, while SportsPro named him the most marketable athlete in the world for 2012 and 2013. His endorsement can make a song or music video go viral; a clip of him appearing onstage with Brazilian pop star Gusttavo Lima has nearly 37 million YouTube views, while a video of him dancing in the locker room to “Ai Se Eu Te Pego,” an international hit by fellow countryman Michel Teló, has 18 million. He appears alongside a number of international stars, including his idols Ronaldo and Wayne Rooney, in Nike’s official World Cup commercials, one of which gained 65 million hits in just three weeks. His youthful enjoyment of life ranges from dyeing his hair blonde and sporting ear plugs to, during a friendly match against South Africa, picking up a child who wandered onto the field and having the entire team hoist him into the sky as part of their victory celebration. And yet, Neymar seems incredibly humble. Part of that humility might come from his devoutly religious upbringing, though even the church didn’t offer a respite from his athletic expectations. At 14, his pastor asked him to stand during a service and proclaimed that God said he would grow up to be an international soccer star. Early in his career, he tithed a tenth of his earnings to the church, but has declined to say how much he’s donated since getting richer. As for his allegiance to his country, he’s already proclaimed his desire to eventually play again in Brazil and retire with Santos rather than spend the twilight of his career abroad, like David Beckham did. That devotion goes a long way for Brazilians; after all, this is the same country whose president officially declared Pelé a national treasure in 1961 so that he legally couldn’t accept more lucrative offers from European clubs. 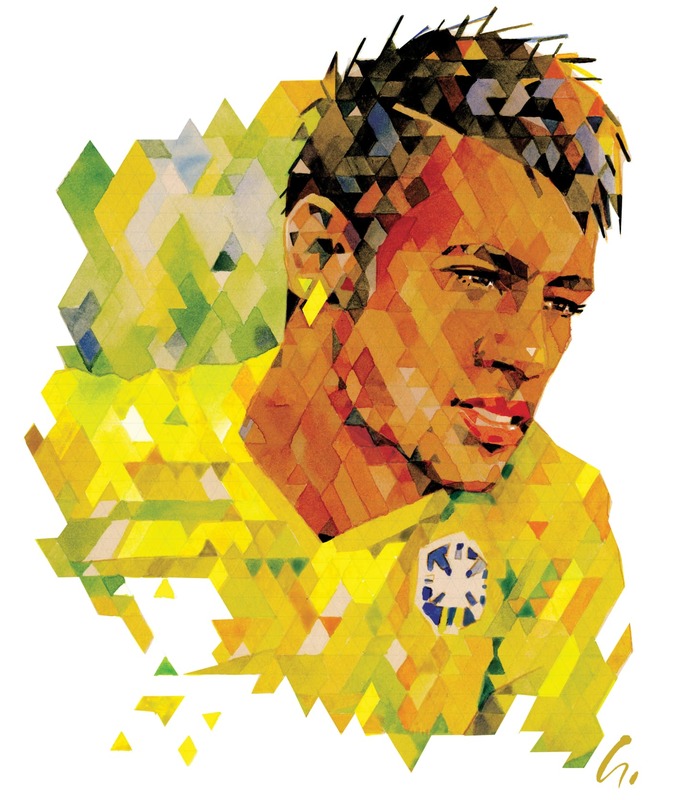 Considering the economic turmoil currently plaguing Brazil, Neymar’s loyalty makes him a much-needed national icon among a populace whose allegiance to their government is being tested greatly. The nation spent roughly $11 billion to host the Cup, leading to nearly two years of demonstrations and riots by citizens who want that money to aid healthcare, education, public transportation and the impoverished. One rallying cry even said, “A teacher is worth more than Neymar.” On top of allegations of government corruption, there have been rampant reports of brutality against the protesters, with Amnesty International claiming that 2,000 people a year there are killed as a result of clashes with law enforcement. It remains to be seen if the collective anger will dissipate or be put on hold for the month-long tournament, but an ever-smiling 22-year-old could be the key for Brazilians to separate their indignation from their national pride while focusing on Neymar and his teammates (unless, that is, he becomes a symbol of government mis-spending itself). The expectations Neymar faces are nearly unheard of for athletes. Soccer is by far the most popular sport in Brazil, with traditions dating back to the late 1800s. Thousands of citizens play at the highest professional levels around the world and, for many, the sport is a way out of the widespread poverty. The national team has won the Cup a record five times, with Pelé starrring on the 1958, ’62 and ’70 squads, though sadly he was too young to compete in front of the home crowd in 1950. Outside of businesses showing World Cup matches, the country virtually shuts down so everyone can watch. The only acceptable result is bringing home the trophy. And until he cedes the number 10 jersey to Brazil’s next young phenom, the pressure of the nation sits squarely on Neymar.